The Centre for Blood Research (CBR) is a multidisciplinary biomedical research institute, situated primarily at the University of British Columbia (UBC) and affiliated teaching hospitals, with nodes at the University of Northern British Columbia and at the University of Victoria. 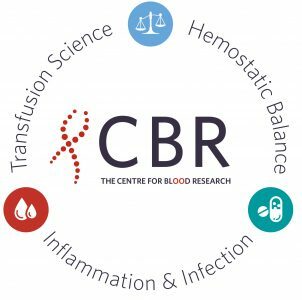 Over 40 research groups at the CBR are working together, using a broad range of leading edge basic science, biotechnological, engineering and clinical investigative approaches on blood and blood-related processes to improve health. The development of safe blood products and blood substitutes to meet increasing transfusion demands. The creation of new knowledge of the mechanism underlying the hemostatic balance and the design and validation of novel approaches to prevent excess bleeding and excess blood clotting. The development of novel techniques to modulate the immune system to prevent and treat inflammatory, infectious and autoimmune diseases and to promote tissue repair. The discovery of blood biomarkers for early detection of disease and monitoring of response to therapy. 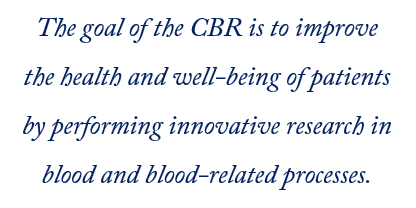 CBR teams are led by internationally recognized investigators who are chemists, biologists, biochemists, pathologists, immunologists, geneticists, engineers, psychologists, sociologists, dentists, pediatricians, hematologists, oncologists, virologists and microbiologists. Group leaders have appointments in the Faculties of Medicine, Applied Science, Arts, Dentistry, Pharmaceutical Sciences and Science. The interdisciplinary nature of the CBR places it in a unique position to create substantial partnerships with other programs and agencies, locally, nationally and internationally, thereby facilitating rapid progress. CBR investigators are committed to sustaining the future of blood-related research and thus have developed highly integrated training and education programs that foster a new generation of curious, inventive and innovative young scientists and clinicians, and promote public awareness and community involvement.